If you’re like me, you left getting the kids’ Halloween costumes to the last minute. 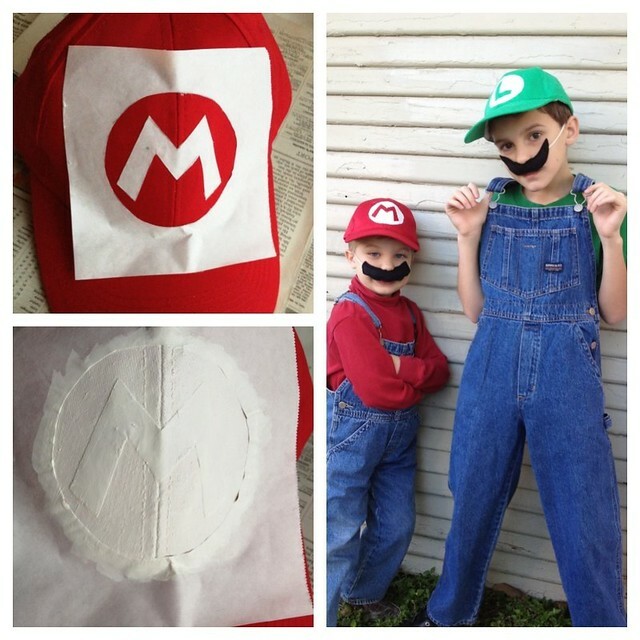 Although we had decided on the Mario brothers theme, and I’d picked up a few things here and there at the thrift store to get ready, I didn’t finish making them until Friday. 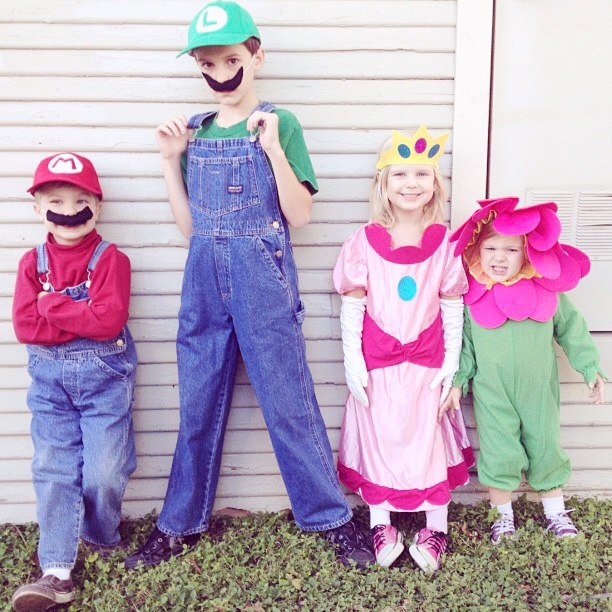 I altered my oldest daughter’s thrifted dress to be Princess Peach and found the flower costume second hand too. 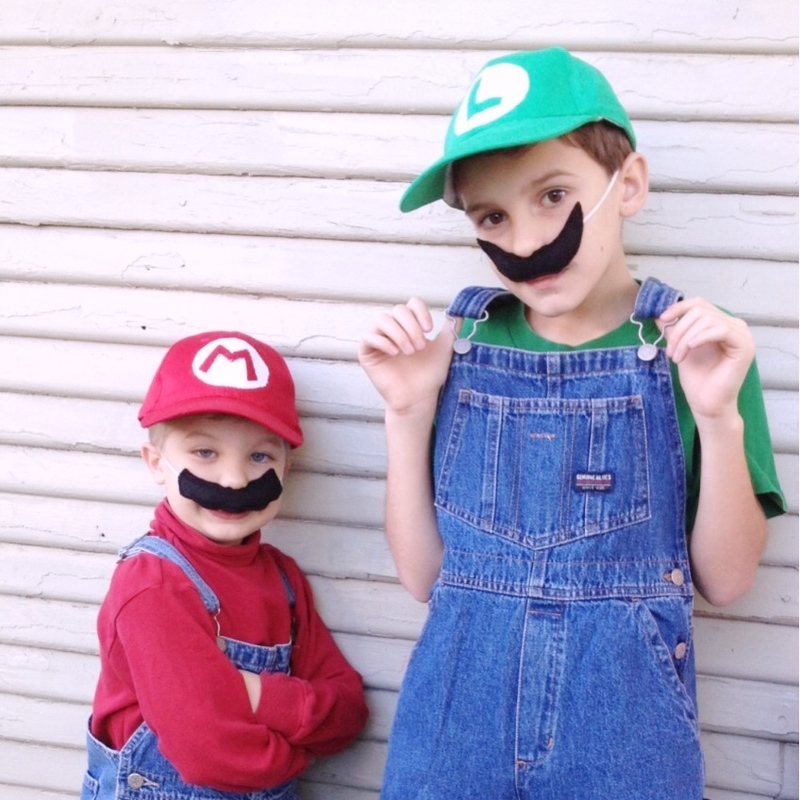 The Mario and Luigi costumes were pretty simple, thrifted overalls and some shirts we already had. All I needed to add were hats and mustaches. 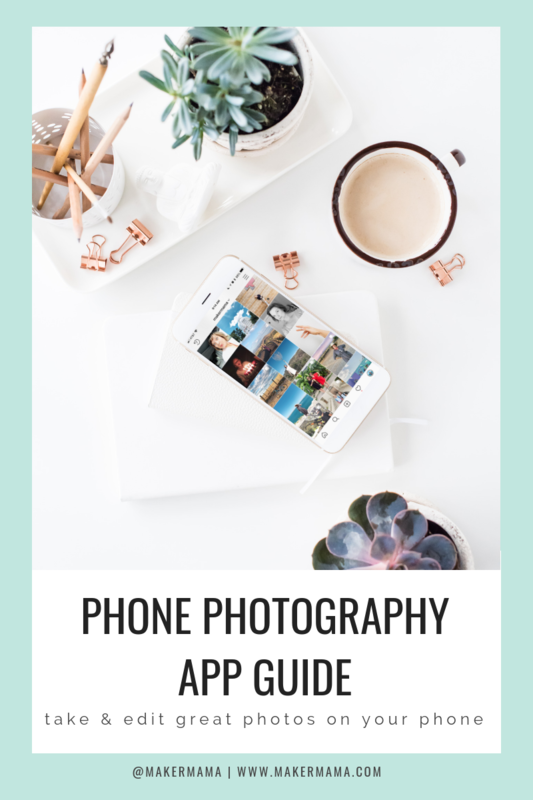 Read on to find out how I made them. 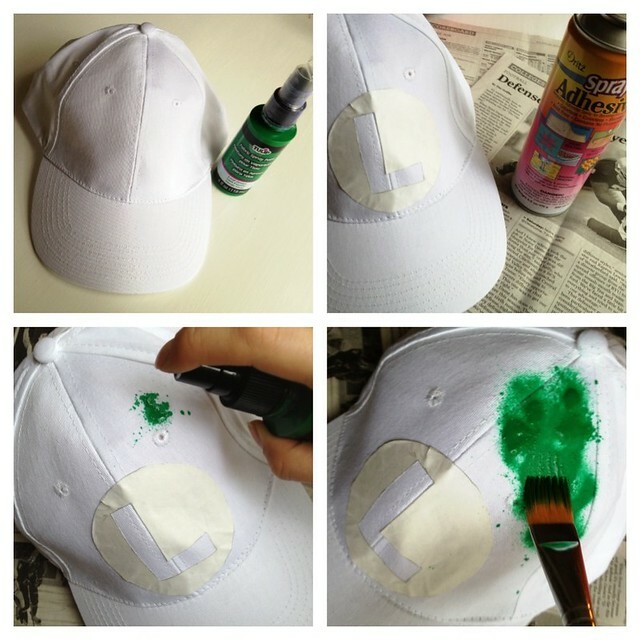 Spray the back of your “L” stencil onto the front center of the white hat, and spray away! I found it best to spray a bit and then use my brush to paint it across the hat. When you come to the stencil, brush away rather than towards it to reduce the chance of bleeding. After painting, peel your stencil away carefully. There were a few spots where my paint bled through, so I took some white fabric paint and touched it up. 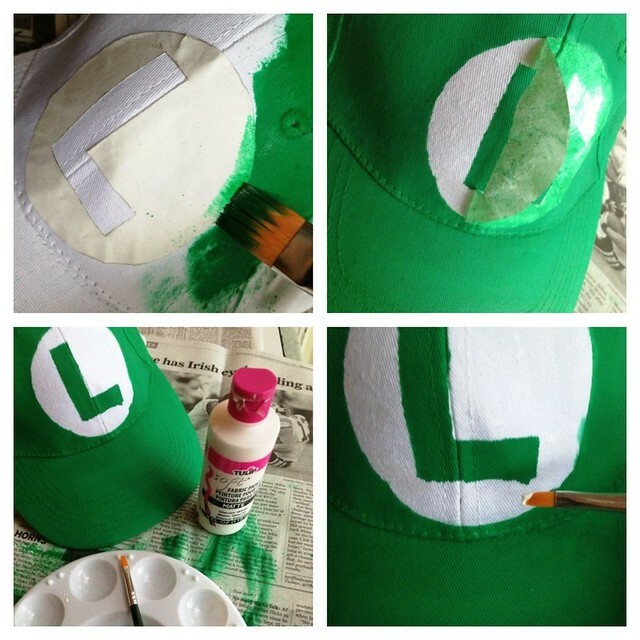 For Mario’s hat, I did a reverse stencil and painted it in with the white fabric paint. For the mustaches I used the templates also from Mum of All Trades, traced them on two layers of felt, pinned some elastic on either side, sewed around leaving one inch open, stuffed with a little polyfil and then finished sewing it up. There you go! 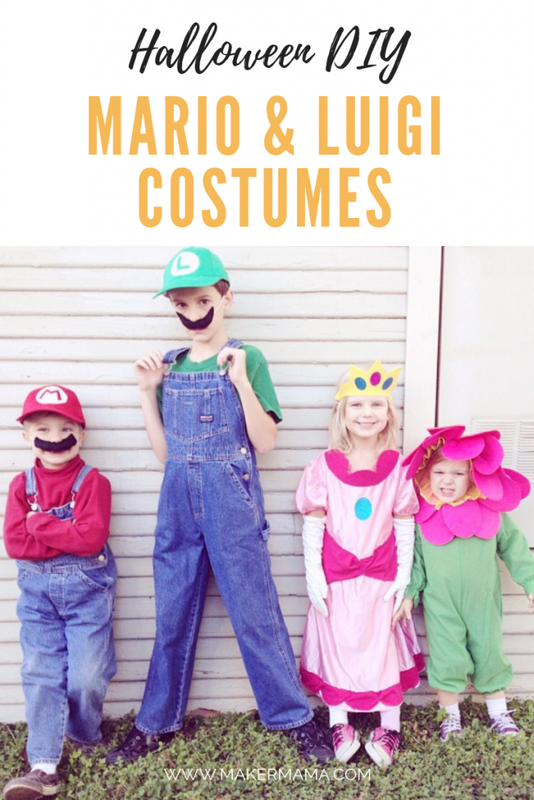 Do you have kids waiting for a costume? 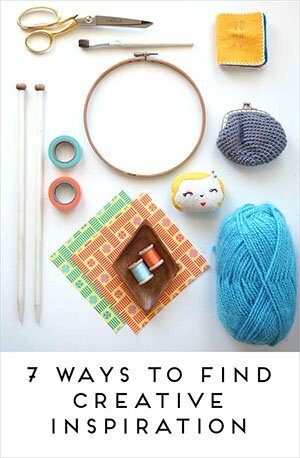 Get off the computer and head to the craft store–there’s still time to pull it off! I wish I was as talented as you are in the craftyness. They came out awesome and are too cute! Pingback: Group Costume Ideas - C.R.A.F.T.